The idea for the recipe came about serendipitously. In Paris last summer, we had arranged to meet a friend for lunch at a new restaurant, but when we discovered it was closed, we found a small café nearby. My spouse and friend ordered “steak frites,” but I chose the cod and vegetables in curry sauce. The latter turned out to be a winner—a dish with a beautiful blend of flavors, colors, and textures. At home, I tried my own version. 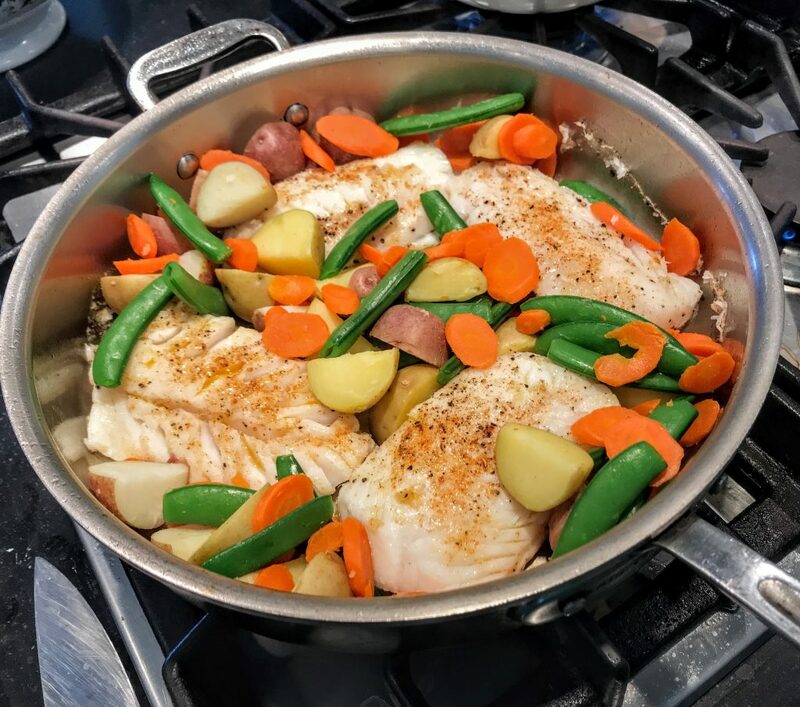 I sautéed thick cod fillets in a skillet, then added a medley of blanched vegetables, including sugar snaps, small red skin potatoes, and carrots to the pan before popping it in the oven. The sauce, which can be assembled ahead, is a combination of leeks, white wine, and cream scented with curry, and takes only about 15 minutes to make. This all-in-one main course is delicate, yet satisfying at the same time. Add a salad of mixed greens tossed in your favorite vinaigrette and a crusty artisan loaf or a baguette to complete the menu. 1. For curry cream, heat oil until hot in a medium, heavy saucepan over medium heat. Add leeks and cook, stirring, until softened, 3 to 4 minutes. Add curry powder and cook and stir 1 minute. Add wine, and cook until it has almost all evaporated, 2 to 3 minutes or longer. Add stock and cook 4 to 5 minutes or until it has reduced to 1 cup. 3. Arrange a rack at center position and preheat oven to 400 degrees F.
4. Bring a large saucepan of water set over high heat to a boil. Add potatoes and carrots and cook until just tender, 6 to 7 minutes. Add sugar snaps and cook 3 minutes more. Drain vegetables in a colander and pat them dry with a kitchen towel. 5. Pat cod fillets dry with paper towels and season each side with salt, black pepper, and cayenne. Heat 2 tablespoons or enough olive oil to coat the bottom of a large, heavy ovenproof skillet well. Set pan over medium high heat and when very hot, add fillets and cook 2 to 3 minutes until lightly browned, then turn and cook a minute more. Scatter the vegetables around the fish. 6. Transfer skillet to the oven. Cook until fish flakes easy and is opaque all the way through, 6 to 8 minutes or more depending on the thickness of the fish. Remove from oven and spoon sauce over the fillets. Sprinkle fish and vegetables with cilantro. Pass remaining sauce in a small bowl . Serves 4. This entry was posted in Food News and tagged cod, curry, vegetables by brosbottom. Bookmark the permalink. I would love to make this dish, but my husband dislikes curry. Could I substitute another herb or seasoning? 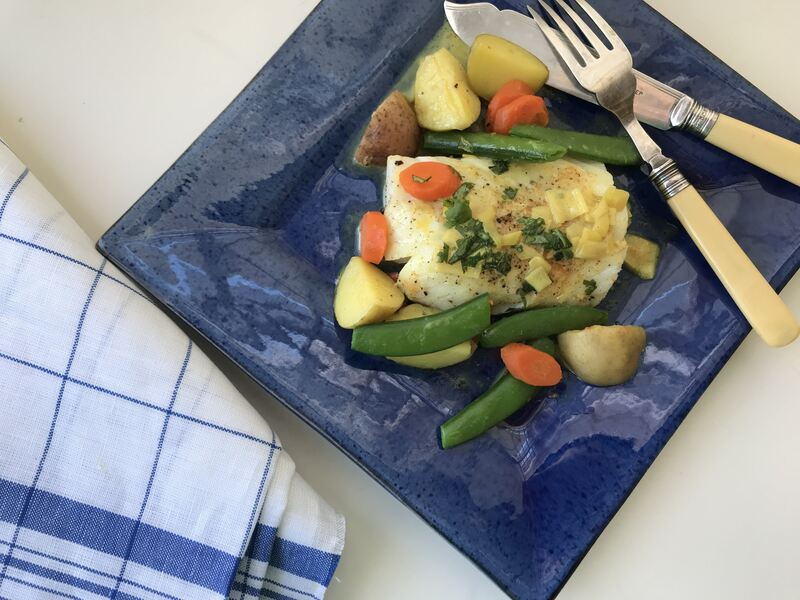 Are you familiar with beurre blanc, the classic butter, shallot, and wine sauce that goes so well with fish? If not, you could just drizzle fish with lemon and melted butter and fresh spring herbs such as chives and tarragon. Sounds delicious and a new way to prepare cod. Hope you get a chance to try it. I’ve made it quite a few times and sometimes I use haricots verts and cook them about 5 minutes instead of the snap peas. Can’t wait to try this! Once I leave Syracuse and arrive in RI in May. Absolutely love your cod with spinach, garbanzoes and lemon. This looks like another keeper and with curry even better! This was great! First time making one of Betty’s recipes, although I have had good intentions of making so many….. The sauce was incredible…. Thanks, I will work to make more in the future. Thanks, Betty – great recipe! My wife doesn’t like it when I cook cod. She says that it’s “bland and boring”. She really enjoyed this dish though! Thanks for the education in cooking cod! Thank you so much, Tim, for note. I’m so pleased your wife liked cod prepared with that curry sauce. My husband has the same view of cod (and other non shellfish!) as your wife, and he liked this recipe too!